I am a devotee of the potato. Mashed, twice baked, casseroled, churned into pies, fried, you name it I love it. One of the things I receive a lot of comments on is my family’s tendency to put mayonnaise in their mashed potatoes. Which I get, kind of, because mayo gets a bum rap, but how is it any different than putting sour cream or even whole milk in your potatoes? We’re all trying to achieve the same thing people, creamy carby goodness. Or in this case, one notch above- cheesy creamy carby goodness. The phrase “au gratin” refers to a technique where a browned crust is created with breadcrumbs or, in this case, cheese. Potatoes au gratin are (in this recipe, at least) scalloped potatoes layered with different types of cheeses, topped with cream, and baked in a shallow dish for an extended period of time. 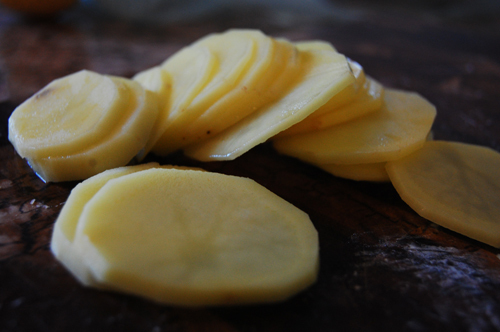 The end result is a crunchy top and layers of soft, gooey, incredible potatoes. This is the kind of dish that you’ll want to make in your big casserole dish. Because this is exactly the type of dish that my sisters and I would eat in bed while watching an entire season of Celebrity Mole the day after Thanksgiving. NEW FEATURE: Finally, a solution to the desire to print, email, & share our recipes has arrived. If you scroll down, just below the instructions and before the comments, you’ll see a row of icons. Run your mouse over them and they’ll jump up to full size, revealing their function. Enjoy! for a small casserole dish. for a larger one, double the ingredients. 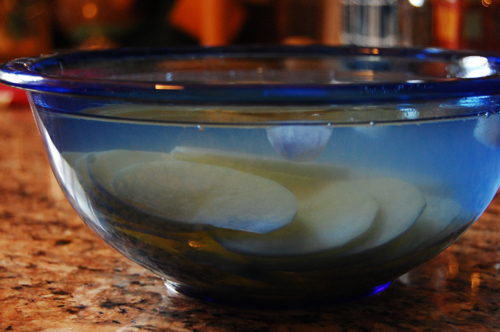 Peel & slice potatoes, putting them in cold water after their sliced to prevent discoloration. Shred your cheese. 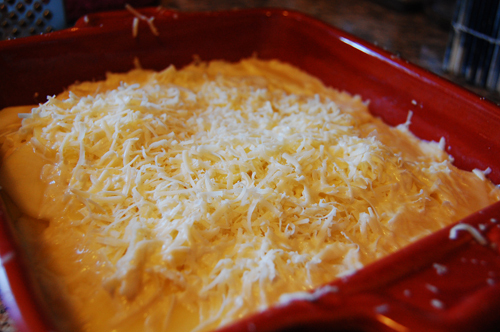 In a small casserole dish, layer potatoes and cheese until you are out of both, ending with a generous layer of cheese. In a sauce pan, scald cream with the whole garlic cloves. 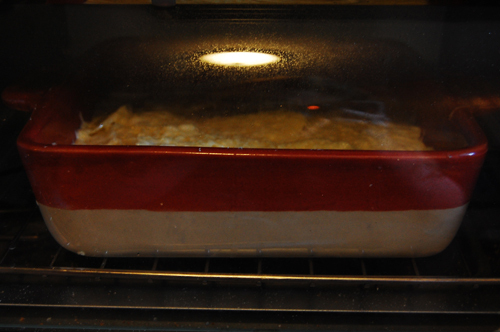 Right before the casserole goes into the oven, pour the cream into the dish. Pour it along the edges so as not to disturb the layers.